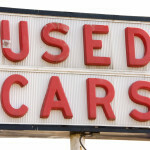 At Cost-U-Less, we try to make buying auto insurance as easy as possible, but buying a used car is a different story. 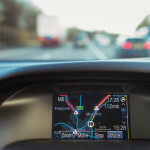 Depending on where you shop, the experience could be stressful, and in some situations the dealership may be trying to sell you a car that isn’t quite worth the sticker price. Avoid getting taken advantage of by becoming a responsible consumer and learning how to inspect the vehicle yourself! These tools will allow you to take accurate notes, check the vehicle’s oil, take a more detailed look at the undercarriage, and test the radio (amongst other things). If your phone is capable of taking notes or has a flashlight, feel free to leave those items behind. Now that we’ve assembled our tools, it’s time to get to the nitty gritty and start inspecting the vehicle. First, you’ll simply want to make sure the windshield is free of cracks, all the vehicle’s body panels are the same color, and all seams are aligned. If a door or the trunk looks crooked, it could be damaged. 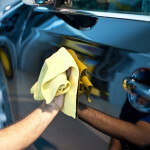 If the vehicle is otherwise free of scratches and dents, it’s time to check the more involved areas. Take your magnet and see if it sticks to each of the individual steel body panels on the vehicle. This is to insure that the paneling hasn’t been replaced with a cheap stand-in. Next, take a good look at the vehicle’s paint job. If it looks like a nice, new paint job, it might’ve been applied to conceal rust. Check to make sure the windshield has wiper blades and test the headlights before moving on. Make sure all doors work as well as all in-car systems like AC and the radio. Don’t forget to check the seatbelts and any extra features like a sunroof. The best way to protect your vehicle is with a great car insurance plan from Cost-U-Less – call or click today! The tires on a used car usually won’t be in peak condition, but inspecting them closely could clue you into a more serious problem with the vehicle as a whole. Make sure the tires are all the same brand and size, and be sure that they’re a reputable brand like Goodyear or Michelin. Check for any obvious signs of damage like bubbles and cracks, and then see if all of the tires are evenly worn – if not, the vehicle could have a suspension or alignment problem. Make sure the spare tire is in good condition and inflated, and be sure that the lack and lug wrench are included if you don’t want to purchase them separately. Make sure the engine is free of leaks, the battery is free of corrosion, and the engine doesn’t give off any unusual odors while running. If the exhaust is an unusual color, like blue or black, it’s likely a sign of engine troubles. To test suspension, give the car a few good bounces on each of its four corners, paying attention to how each corner reacts. You want all of them to feel similar, and you want the vehicle to be completely level while at rest – anything else is indicative of suspension problems. For vehicles with an automatic transmission, be sure that the transmission fluid is clean and free of dirt and grime. Give it a drive around the block to check for any gear slips or delays. For vehicles with a manual transmission, as long as all of the gears shift smoothly and the vehicle doesn’t grind while driving in reverse, you’re good to go. If the dealer won’t let you inspect the vehicle, walk away immediately. 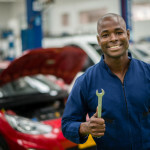 You should feel free to inspect the vehicle at your own pace, so take your time and spot as many flaws as possible – you can use them to bring down the price of the vehicle. Have any other suggestions or tips? Let us know in the comments section below, and call or click Cost-U-Less today for more information about our auto insurance policies. Get your free car insurance quotes today! No auto insurance policy can stop you from buying a broken-down used vehicle. Learn how to pick a used car that won’t let you down.